Modern Orthopaedics known to Egyptian healers? In August 1995, Dr. Wilfred Griggs led a team of scientists from Brigham Young University who were conducting DNA research on the six resident mummies in the Museum . 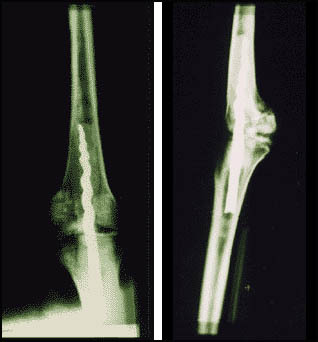 During the research, an X-ray revealed a metal pin in the left leg of Usermontu. At first Dr. Griggs thought the screw "must have been a recent attempt to repair the mummy, maybe no more than 100 years ago. When we first saw the x-rays in August, I thought it was interesting that some modern person would go to this much trouble to fix the leg, because I've never known or seen something like it. It never occurred to me at that time that there could have been anything ancient to this." continued Griggs. [Above:] In their ongoing study of mummy DNA, a research team from Brigham Young University -- headed by ancient studies scholar Dr. Wilfred Griggs (left) and microbiologist Dr. Scott Woodward (second from left) -- examines a mummy at the Rosicrucian Egyptian Museum in San Jose, California. So intrigued by the possibilities of this find, that in November Dr. Griggs returned to the Museum one evening to take a closer look. After about 30 minutes of looking closely at the leg, Dr. Griggs decided that the pin was much older than he anticipated, and was so excited that it was worth a full scale investigation. "That's when the roof fell on me and I began to question everything about what we were seeing. And that's when I knew I would need to return to figure out the mystery before us," said Griggs. On February 8, 1996, Dr. Griggs returned with specialists to determine if this was the first attempt at ancient knee surgery ever discovered. And to our surprise, there is no doubt in anyone's mind that this is definitely an ancient operation. Never before has an Egyptian mummy anywhere exhibited such a characteristic. Dr. Griggs and his retinue of researchers from Brigham Young University were themselves taken aback at the historical implications of this metal pin. Throughout the day-long procedure, initial findings elicited provocative questions as to the exact function and nature of the pin. Was the pin inserted while he was still living or just after he died? Was the pin placed in the knee as a result of some sort of trauma? To date, we know that the metallic composition of the corkscrew pin consists of pure iron, and that it was put in before Usermontu was mummified. This corresponds with the accepted time period of Usermontu's life (ca. 630 B.C.) and Egypt's iron age. The drilling procedure to extract material from the back of Usermontu's knee was in itself amazing. Dave McCann, who did the actual drilling, said that the drill bit would be moving as fast as 75,000 rpm. So precise and gentle is the drill that it could create a minute hole on the shell of an egg. In addition to the drilling done, researchers were able to insert a small probe to look inside the leg and get a glimpse of the pin, as well as see a glue-like resin surrounding it, probably used to cement the screw into place. Not only were the researchers amazed that the pin is ancient, but the highly advanced design had the visiting surgeons in awe. "The pin is made with some of the same designs we use today to get good stabilization of the bone," said Dr. Richard Jackson, an orthopedic surgeon from BYU. Apparently, the ancients knew how to use the flanges on a screw to stabilize the rotation of the leg. The knee is one of the most complex joints in the human body. It has to sustain the weight of the entire body and must endure repeated impacts from walking and running. At work, it must endure even heavier loads. 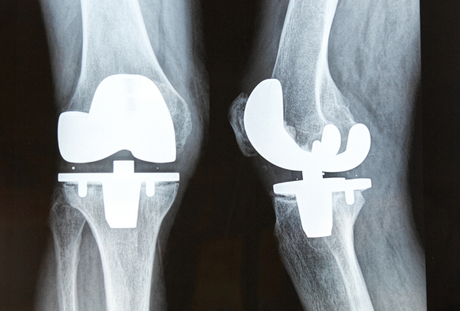 Modern knee replacement surgery [right] used hi-tech materials to maintain flexibility and weight-bearing. But the ancients did not have this technology. A failure of the knee joint would mean that the vistim would be confined to either a bed or chair and would likely endure severe pain if the limg was moved. 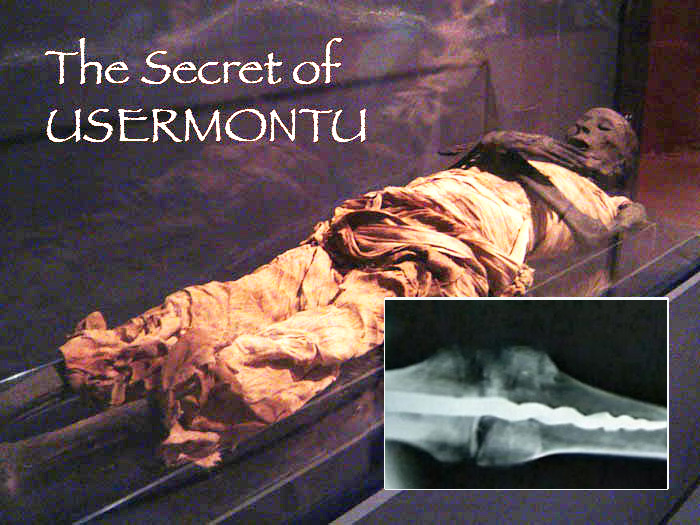 The most effective remedy was to mmobilize the joint, as was done to Usermontu. This surgery would have allowed the patient to walk with a cane and would have prevented continuous pain. As the researchers continue to study the results, we will keep you informed. The more we learn about this fascinating mummy, the more we realize that he must have been a very important person to not only be mummified with such care and professionalism, but also to have such a potentially expensive metal pin placed in his leg. In a way, through this discovery Usermontu has achieved immortality. As Dr. Griggs explained, "This man has a story to tell and it's now being told through small bits and pieces of tissue. We just keep adding pieces of the puzzle." "I have to give the ancients a lot of credit for what they have done," added Dr. Griggs.